Travel Leaders Corporate has made data available for average nightly hotel rate and average base rates for rental cars in the top 25 U.S. cities. Hotel rates by city were extremely fluid in the fourth quarter. Two major cities, Chicago and New York saw significant drops, while cities like Miami, Phoenix, and Tampa were all up double digits. 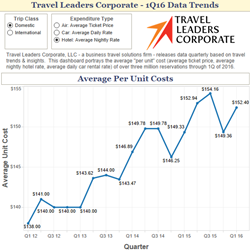 Today, Travel Leaders Corporate released an analysis of its business travel clients’ aggregated booking data from the first quarter of 2016. The average cost per trip continued its trend of a small increase over the fourth quarter; however, business travelers in Chicago and New York City experienced a significant drop in average nightly hotel rates. New York City’s average hotel rates dropped 18% to $213.69, the lowest average nightly rate since Travel Leaders Corporate began tracking costs by city. Chicago average hotel rates dropped 7% from the first quarter of 2015 to $147.16 per night. All other top 25 American markets were flat or showed a price increase. According to Travel Leaders Corporate’s data, international trip costs have ended their long and steep decline, with a modest average price increase in the first quarter, even though average days per trip held steady. The average international airfare cost increased nearly 3% to an average of $1,565.68, which is still the second lowest quarter of the last four years. Average hotel nightly rates and average rental car base rates both dropped by 9% in the first quarter of the year compared to the fourth quarter of 2015. Hotel: For the first time, Travel Leaders Corporate data for average hotel nightly rates are now available for each of the top 25 American markets. Travel Leaders Corporate’s data indicates that average nightly hotel rates increased to $152.40 per night after the normal decline in the fourth quarter. However, prices were variable depending on the city with some markets exaggerating the trend. Phoenix saw the largest increase, with average nightly rates climbing 59% in the first quarter to $191.77 per day. For more information or to take advantage of Travel Leaders Corporate’s personalized service and cutting-edge corporate business travel solutions that provide a complete travel enrichment experience, email partnerships(at)tlcorporate(dot)com or call 877-404-4173.